5 a.m. 13 Dec 2017. At night, I can really see the flames—ominous, chewing away, melting everything in its path. A spiraling flare of tremendous red that looks big from where I sit miles away means large things are burning, big trees, maybe big buildings, maybe oil business paraphernalia and then comes the black smoke, which contains the particles of a hotter fire that’s extinguished items of purpose, now some new old purpose. The fire keeping me awake this dark morning is on the peak of a mountain ridge across the Upper Ojai Valley in Southern California from where I sit on a deck that didn’t burn in the fire when it came through here. This valley, my valley on a plateau that stretches between Ojai Town and Santa Paula for about ten miles is burned through, so they say, although earlier this night a house across the road that survived the #thomasfire caught fire when the electricity was restored. Seems to me the fire gods are having their own say. Little pockets of smoke reveal fires in our yard and all over the hills from roots slowly burning which may take weeks. Some smoldering fires are oil seeps, a local item that springs up along fractures in the earth in this part of the world and they may burn a long, long time. 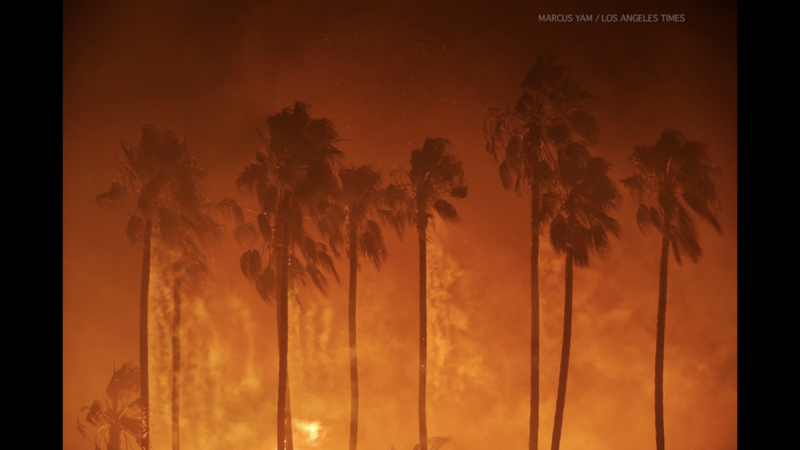 There are many big fires still burning all over Southern California: Thomas, Skirball, Sylmar, Lilac, probably more. Without TV or reliable Internet, it’s hard to keep up. No rain for months coupled with 70mph Santa Ana winds lit up the sky around me nine days ago and with little warning, Eric and I with our precious dog, Rocco, drove away fast with flames all around. The #thomasfire, my fire, burned up and spewed out everything around my abode: cars (my car), homes, ancient oaks, animals trapped in barns (not my animals), trailers, garages, fences, pictures, tools, golf clubs, books, family heirlooms, family Christmas ornaments…the animals trapped in barns haunt me in my sleep. But by some miracle the house did not burn. But why not? Not one window broke in this wood Victorian, including the fireplace logs leaning against the house. 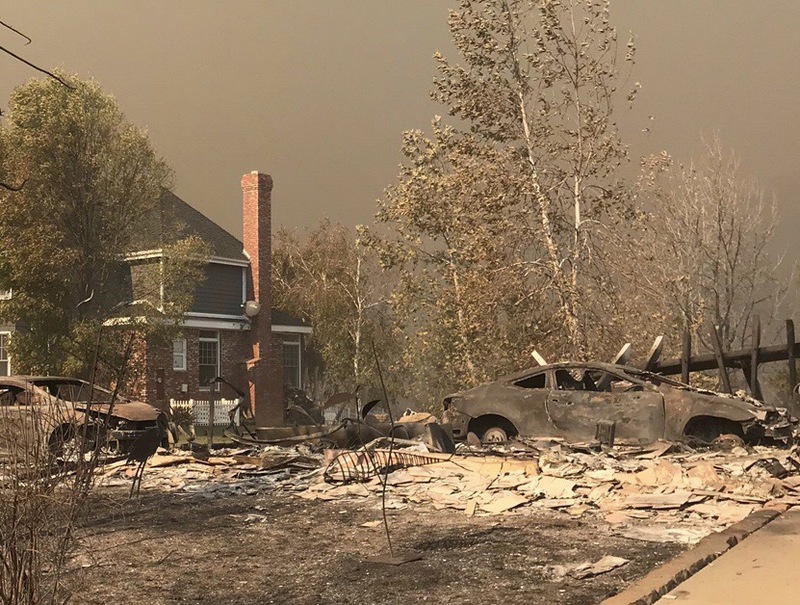 Maybe the recently watered grass and trees that surround the house, maybe the wind changed or maybe the fire gods didn’t need it on their march, doing what they do, burn, burn, burn. The irony is we create our own disasters by doing what we do, building things where fires have always burned, but where on the planet is there not Nature calamities for human-born projects? Flood, tornadoes, hurricanes…btw Nature runs things on this rock, in case we all forgot. We are merely allowed to reside in the beauty for a very brief span of time. On this day many of my memories and the comforts of home for a lot of my neighbors now reside in piles of ash, totally unrecognizable from their previous state. The remarkable thing about humans is the desire to mold that dust back into some sort of tangible thing to hold or love whether it be a structure or a handmade quilt. This valley is so unique, so beautiful, I bet they’ll all rebuild. Maybe it’s easier for me, having already gone through the process of losing my home and precious belongings in some other disaster seven years ago. I survived and my life got better. And if old-timers know, I’m told the fires are done with me, for now. But I keep my mother’s quilt nearby just in case we need to run again. 6 a.m. Dawn. The rooster just crowed! I thought he was dead because of his silence these past nine days. I know it’s the one before the fire because he has a particular skrackle-doo. What a great morning! And anyway, I can’t see flames in the daylight.